Want to sell your junk car for cash in Kansas? The Clunker Junker can help. Whether you’re climbing the humble Mount Sunflower or walking through the flatness of the cornfields, Kansas is a place where you need great transportation. You don’t want to be getting around in an old junk car that could break down at any minute, if it hasn’t already. Kansas is large and vast, and you don’t want to be stranded in the middle of nowhere on I-70 headed for Topeka! That’s why The Clunker Junker pays cash for cars in Kansas! Not only that, but we will also come to you and tow the car away at no extra charge. Whether your car is complete junk and doesn’t run, was wrecked in an accident, or you need a down payment on a newer and nicer vehicle to outrun twisters, The Clunker Junker has you covered! We buy cars in Kansas in almost any condition, as long as they are complete. If you want cash for junk cars in the Wheat State, you’ll need to hear what we have to say about junking clunkers. So grab toto and follow the yellow brick road that leads to more money in your pocket. Don’t be a scarecrow, have the courage to get rid of that old tin can of a car that’s been rotting away without oil in your yard for the last few years. 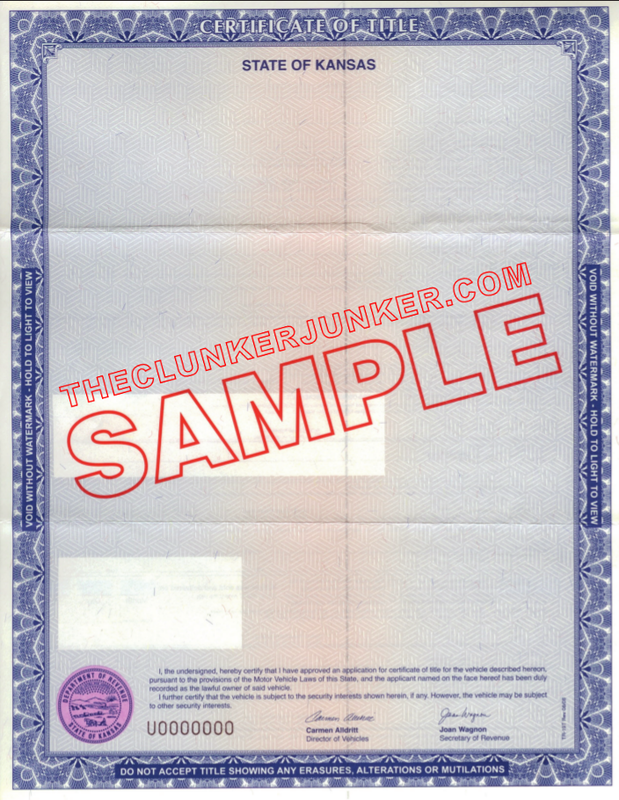 It’s time to peak behind the curtain and see just how easy it is to sell your junk car in Kansas with The Clunker Junker! If you’re looking for your top dollar for junk cars, your first instinct may be to take it to a Kansas auto salvage yard or place an add online. While it’s true that getting cash for junk cars in Kansas is easier than in other states, we can make it even easier for you. We buy junk cars all over the Free State. Before you can sell your junk car in Kansas, you should answer a few questions, however. On this page is a super easy vehicle condition questionnaire form that you can use to get an instant offer for your car. We'll need year, make, model, condition, and title status. Unlike many of our competitors, you'll be shown an instant offer for your vehicle in most cases. If you accept, one of our local Kansas junk car buyers will promptly reach out to you to schedule a time for pickup. When the junk car removal team arrives, they'll look over the car quickly to make sure the condition you stated is accurate. They'll load the vehicle up on their tow truck and pay you either cash or check for your junk car right there on the spot. There are never any hidden fees! How Much Cash Can I Sell My Junk Car For In Kansas? Are you looking to get cash for cars in Kansas? If so, how much? We offer three tiers of cash compensation for clunkers. The clunkiest of the clunkers will be easy to junk in big Kansas cities like Wichita, but in more rural areas you’ll have a few issues. We’ll offer you between $50 and $175 for the scrap heap in your driveway. If you can still drive the junk car, it’ll be juicier to sell. Any car with working parts will net you as much as a few hundred dollars. The cars that aren’t yet ready for the junk yards are hard to part with. But we’ll still buy them from you! Kansas junk car removal is easy when you go through us, even if the car is in better condition than you would expect for a junker. You might even make up to $10,000 for your serviceable car. We have put together a simple guide and example for how to sign your Kansas title when you are selling your vehicle. If there are multiple owners listed on the title, they must all sign the title unless the names are separated with "OR". In Kansas you will need to sign and print in the "Assignment of title" section on the top part of the back of the title. 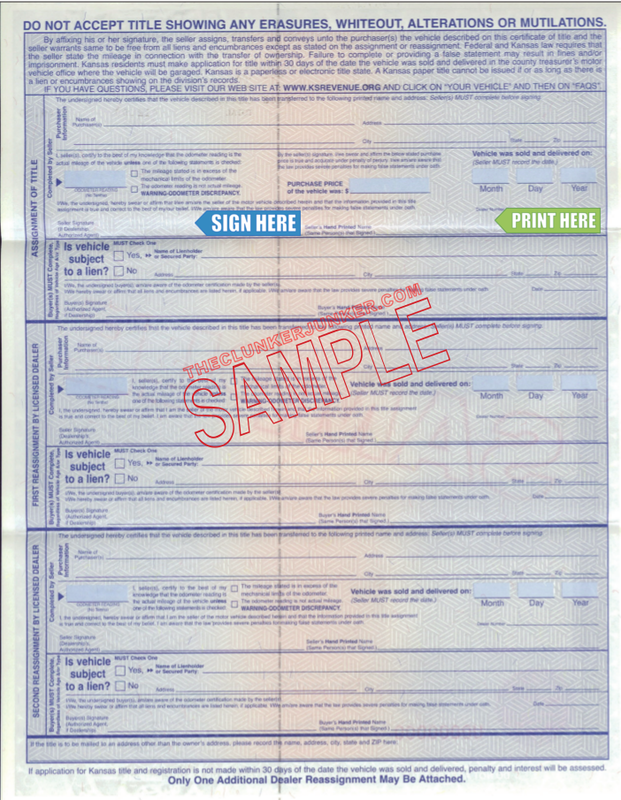 Do not sign or print in the "Re-assignemnt by licensed dealer". First sign the back of the title where indicated by "Seller Signature". 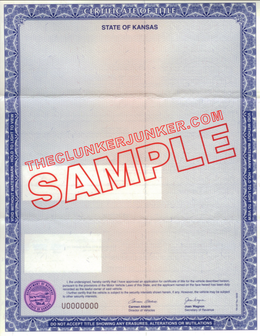 Print (don't sign) your name on the back of the title where it reads "Seller's Hand Printed Name". 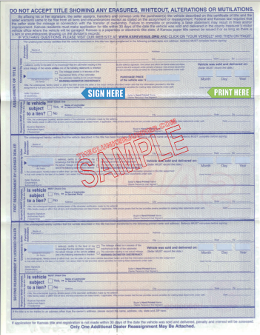 Fill out the Kansas Manual Application for Duplicate, Secured or Reissue Title. The fee for a replacement Kansas title is $10.00. There is a 10 to 40 day waiting period for new titles to be issued. Getting rid of an abandoned vehicle in Kansas can be a difficult process. Unfortunately, you cannot just sell any junk car that ends up on your property if you do not own it. You'll need to follow the Kansas abandoned vehicle removal procedures. We have given a general overview of what that entails below. If a vehicle has been abandoned on your private property, you may have it towed away by contacting your local law enforcement office. If you would like to apply for a Quiet Title through the District Court, you will need to fill out an Abandoned Vehicle Affidavit. If you are unable to apply for a Quiet Title, you may purchase the vehicle at public auction. Can I sell my car in Kansas if I don’t have the title? Unfortunately not, we cannot buy vehicles in Kansas unless they have a title. We would be happy to help you through the process of obtaining a duplicate title through your DMV, just let us know if you need help! Kansas often changes their title documents from year to year. If you have questions about your specific title, please contact your Kansas DMV. Once you have sold your junk car to us, you can take the money and spend it on a new vehicle which you can use to tour the great plains. Cruise over to the Kansas monument rocks during the evening for an amazing show of the evening sky. Hit up the county fair in Lawrence, or ride around Kansas City. Fly along I-70 from end to end in record time. If you’re interested in selling your junk car in the sunflower state, we’ll happily take it off your hands. We’ll arrange a tow, hand you a wad of cash, and help you with all of the relevant paperwork. Contact us today to see how you can get paid by junking your old car. "I'm junking it because the expense of fixing it up to pass inspection is worth more than what I am willing to pay. The car drives fine, though. " "Everything that should be on the vehicle is on the vehicle. The only reason why we're trying to junk it is because the motor needs to be replaced, and we don't have the cash for that. We are hoping to get a cash offer of at least $600 based on the condition of the car." "My husband took the battery and the radio out of the car. Currently, it is not driveable because it doesn't have a battery. It would be driveable, but needs a tuneup really badly. I thought I had the title, but I just searched high and low for it, and I cannot find it. It is currently registered, though." "The car has a worn paint job and slightly messed up interior. The roof on the interior has some scratches, the center air vents are smashed in, there is no radio, and the battery is dead. The car won't start. I was having trouble with the ignition systems, so that's why the car won't start, and I do not have time or energy to fix it. I just need the car to be gone. It's parked in a parking spot in my apartment complex, so it's not hard to access. It was involved in one minor accident, where my civic rear-ended another car at 5mph, and the passenger-side headlight is slightly smashed in but still works. " "The vehicle hasn't started in about eight months, though it ran reliably before that. It has one flat on it, and the spare is flat, too. I'm trying to get rid of it, since my husband and I have downsized to one car, and we really don't need it taking up space in our backyard." "The automatic transmission stick is missing the screw that holds it together. I'm trying to junk it because I live in the downtown area and no longer need a personal car." The Clunker Junker is one of the top junk car buyers in the state of Kansas. To date we have made instant offers on over 10 thousand vehicles across the state, totaling over $2.8 Million offered! Of those vehicles, approximately 5% were purchased without a title. We also buy cars on a wide spectrum of conditions and 60% of the vehicles we've made offers on in Kansas do not start or drive. Many also have moderate to severe body damage. Wichita in Sedgwick County was our top producer, followed by Topeka.